In Monday's protest, Israeli forces killed 58 Palestinians, most by gunfire, and injured more than 2,700, Gaza health officials said. 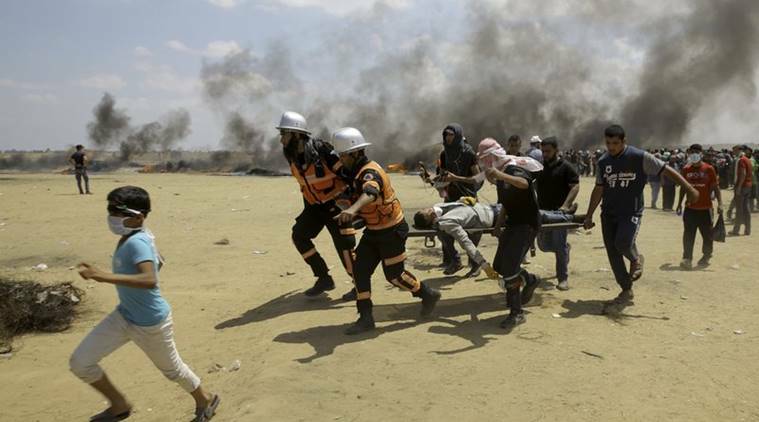 Palestinian medics and protesters evacuate a wounded youth during a protest at the Gaza Strip’s border with Israel, east of Khan Younis, Gaza Strip, Monday, May 14, 2018. Thousands of Palestinians are protesting near Gaza’s border with Israel, as Israel prepared for the festive inauguration of a new U.S. Embassy in contested Jerusalem. Gaza City: Palestinians observed a strike on Tuesday to mourn dozens killed by Israeli troops in a mass protest on the Gaza border — the single deadliest day there since a 2014 war and part of a high-stakes campaign by Gaza’s Hamas rulers to break a decade-long border blockade. The high casualty toll also revived international criticism of Israel’s use of lethal force against unarmed protesters. At the same time, the opening of the embassy, condemned by Palestinians as blatantly pro-Israel, further dimmed prospects of what President Donald Trump had once touted as plans to negotiate the Mideast “deal of the century.” The U.N. Security Council planned to meet Tuesday to discuss the violence, though it was not clear what might come out of the session. 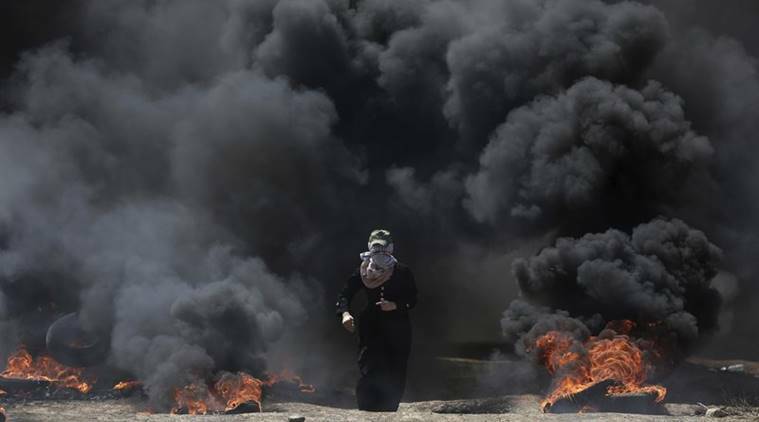 A Palestinian woman walks through black smoke from burning tires during a protest on the Gaza Strip’s border with Israel, Monday, May 14, 2018. Thousands of Palestinians are protesting near Gaza’s border with Israel, as Israel prepared for the festive inauguration of a new U.S. Embassy in contested Jerusalem. Two UN diplomats said members couldn’t reach unanimous agreement on issuing a proposed statement, circulated by Kuwait, that would have expressed “outrage and sorrow” over the killings and sought an independent investigation. The diplomats spoke on condition of anonymity because the discussions were supposed to be private.